The International Organization for the Family (IOF) has just concluded the most important, influential World Congress of Families gathering we've ever conducted. The left is going berserk as they come to realize that IOF has reached a new level and is now in a position to help educate, equip and mobilize pro-family leaders and activists on a worldwide scale. And they are not too happy about our success. Confronted by the reality that IOF is now in a position to gain the attention and support of governmental leaders including heads of state, leaders of the world's major religions and officials from business and industry, the Fake News and their allies on the left have launched a reputational attack on us on an unprecedented scale. "[In] the Italian city of love, an international alliance of far-right politicians, conservative activists and religious leaders have united in hate." "The World Congress of Families…provid[ed] a platform for right-wing extremists seeking to reopen the debate about abortion…[T]he leader of Italy's other main coalition party…described the event as 'medieval.'" "The notoriously anti-gay World Congress of Families [convened] an annual summit billed as 'an Olympics of social conservatism":…[O]ne of the world's most powerful anti-choice and anti-LGBTQ groups….Half the government is endorsing WCF." "'It's being attended by characters we shouldn't even be discussing in Italy.' Those personalities include Brian Brown, the WCF president." We take this negative press coverage as a tremendous complement. The screaming headlines and sensational statements simply serve to underscore the point that IOF, which organizes and conducts the World Congress of Families, is making a tremendous difference, providing leadership on an international scale on behalf of the family. We are working closely with heads of state, governmental ministers, regional and local political leaders, as well as pro-family leaders and groups across the world. And we are being successful, which is why the left attacks us so viciously. You can help us combat the Fake News and their leftist allies by helping us build on the success of WCFXIII. Please consider making a financial contribution today so that we can continue to help lead the worldwide pro-family movement. 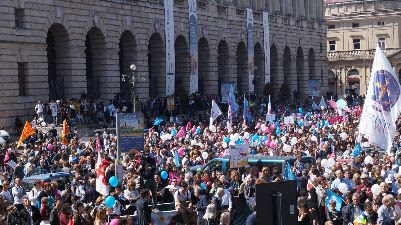 "Several tens of thousands of people marched in support of the ultra-conservative World Congress of Families on Sunday, on the final day of their conference." I truly believe that our success in Verona with WCF XIII has taken the International Organization for the Family to the next level. We are now in a position to educate, equip and engage people on a truly global sale. Because of this, we'll be able to accomplish more in terms of encouraging the enactment of pro-family policies in every region of the world. Thank you for your prayers, friendship and support!